President Moon Jae-in and Qatar’s emir held a summit Monday to discuss ways to expand economic ties and promote bilateral cooperation, the presidential office Cheong Wa Dae said. As part of his first summit diplomacy in the new year, Moon met with Emir Sheikh Tamim bin Hamad Al Thani, who arrived in Seoul on Sunday for a two-day official visit. The monarch is Qatar’s head of state. They discussed ways to help South Korean companies expand forays into various fields in the Gulf state, including transportation and infrastructure, from the current energy and construction-focused sectors, Cheong Wa Dae added. Qatar is South Korea’s largest supplier of liquefied natural gas and sixth-largest supplier of oil. In addition to the summit, Korea’s Oceans Ministry said that it has clinched an agreement with its Qatari counterpart to forge deeper ties in maritime affairs, including the fishery and aquaculture industries. The agreement is in line with Korea and Qatar’s summit in Seoul aimed at expanding economic ties and promoting bilateral cooperation. The Ministry of Oceans and Fisheries said the two countries agreed to work closely as Qatar currently plans to ease its dependency on foreign countries for its food supply. Accordingly, the two will exchange related technologies and carry out joint research projects. The two countries also agreed to acknowledge each other’s marine technician license, paving the way for South Korean experts to be employed by Qatari shipping companies. 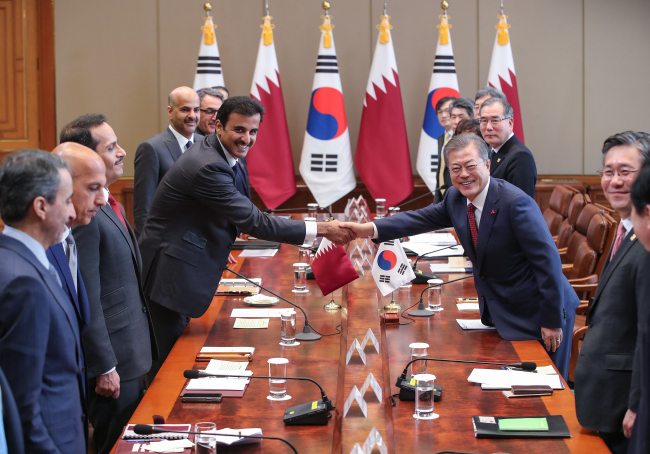 Korea’s Busan Port Authority and Mwani Qatar, which is responsible for the management of Qatari ports, agreed to exchange information on the running of ports as well. The ministry added the agreement will help local companies expand their presence in the Qatari market. “Although the exchanges in the maritime industry are in the early stages compared with traditional areas like energy and construction, we plan to promptly roll out follow-up measures to help competitive South Korean firms and experts set their sights on the overseas markets,” Oceans Minister Kim Young-choon said.